First Class PU leather cover with Slim Fit Hard Case Holder. 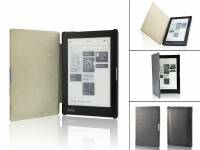 Designed for the Kobo Aura 6 inch e-reader. Worldwide shipping. Order online at 123bestdeal.